Are you looking for a place to find gold ingots for sale? Gold ingots could usually be found where gold bullion coins and bars are sold. Since ingots are virtually the same as gold bars, most online gold dealers will carry a small or a large assortment of gold ingots for sale. EBay is a great place to find gold ingots for sale; you just never know who is going to sell a special gold ingot for an even more special price. Take care to buy exclusively from top rated sellers to ensure ingot authenticity and honest delivery. Take our word and don’t get carried away with auction bidding, keep realistic price range in mind for your gold ingot for sale and stick to it, there will always be another gold ingot. The main difference between an ingot and a bar is a method of production. 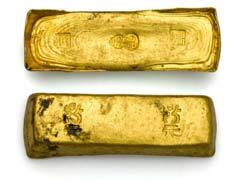 While gold bullion bars are stamped, ingots are poured in gold ingot mold to end up with thicker bars. Gold ingots for sale come in a vast variety of sizes ranging from 1 gram to all the way up to 400 ounces like a London Good Delivery Bar. Gold ingots price depends solely on the spot price of gold and the finesse of a specific bar. Shop around to find gold ingots for sale at a reasonable price and compare it with the spot price of gold on a particular day. There are quite a few of online places that take pride in their return customers and 100% client satisfaction. Among these places are APMEX, Gold Silver, Monex and Bullion Vault, the latter provides physical gold storage services so you do not have to make arrangements and incur significant gold storage costs. Bullion Vault will take care of your gold storage needs at their sophisticated state of the art vault system.